Clarke, 33, managed just one birdie in a one over par round that leaves a question mark over his chances of making an impact this week. Once again the putter was the culprit as Dungannon man used the blade 30 times in all. That was three putts fewer than Padraig Harrington - but the Dubliner hit 15 greens in regulation as opposed to just 10 for Clarke. "I played average and putted even more average," said Clarke afterwards. "That's it. There isn't a lot more to say. It's the same old story and I'm off to the putting green now to see if I can do something about it." As playing partner David Toms birdied two of the first three holes one his way to a four under par 67, Clarke was always struggling after bogeys at the fourth and sixth. He steadied the ship after that but couldn't buy a putt on the greens as he made 10 pars in a row from the seventh to the 16th. He finally clawed a shot back when the hit the 546 yard 17th in two but his 20-foot eagle putt stopped a couple of rolls short of the hole and his birdie was a tap in job. It was a similar story at the 18th where he struck a lovely 25 foot birdie putt that stopped just inches short of the target. Clarke said: "The ball was running and it was a perfect day for scoring. We aren't going to play Muirfield on a much easier day than today." Asked if he would have preferred more difficult conditions Clarke wasn't so sure. "The way I hit it today, I'm not so sure that links courses really suit me. Let's see what we can do tomorrow." Clarke hit 11 of 14 fairways but couldn't get the ball on the green in the required number of shots. 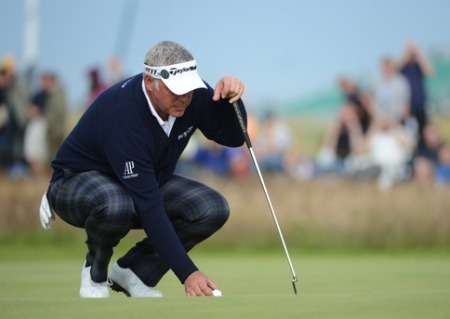 Darren Clarke had 30 putts in the second round. Picture Fran Caffrey www.golffile.ieDarren Clarke headed straight for a sunny Bahamas after his Open defence turned into a damp squib. Darren Clarke enjoyed the first round of The Open despite the brutal conditions. Picture Eoin Clarke www.golffile.ieDarren Clarke survived a “brutal” Muirfield and headed straight for the range to straighten out his swing.